Jeanne Missey Osgood, MA, is an educator: yoga/Pilates/fitness teacher, President of the Tucson Poetry Society, poetry enthusiast and puppeteer. She has created one-woman shows from her experiences and interests through her life. Memorizing, reciting and writing poetry as well as telling wisdom stories were an important part of explaining truths as both a student development practitioner in higher education, as a fitness director and yoga teacher. When her love of puppetry was explored more fully, she found that it was quite effective and entertaining to share wisdom and poetry by having her puppets do most of the talking. She and her puppets now entertain audiences of all ages. There is an elephant in the room... it is LOVE! very early editions of poetry in the public domain, A Companion to Emily Dickinson Edited by Martha Nell Smith and Mary Loeffelholz, Lives Like Loaded Guns: Emily Dickinson and Her Family Feuds by Lyndall Gordon and an on-line edX course on American Poets from Harvard Professor Elisa New, PhD. The course covered who Emily Dickinson was, where she lived and how she wrote. 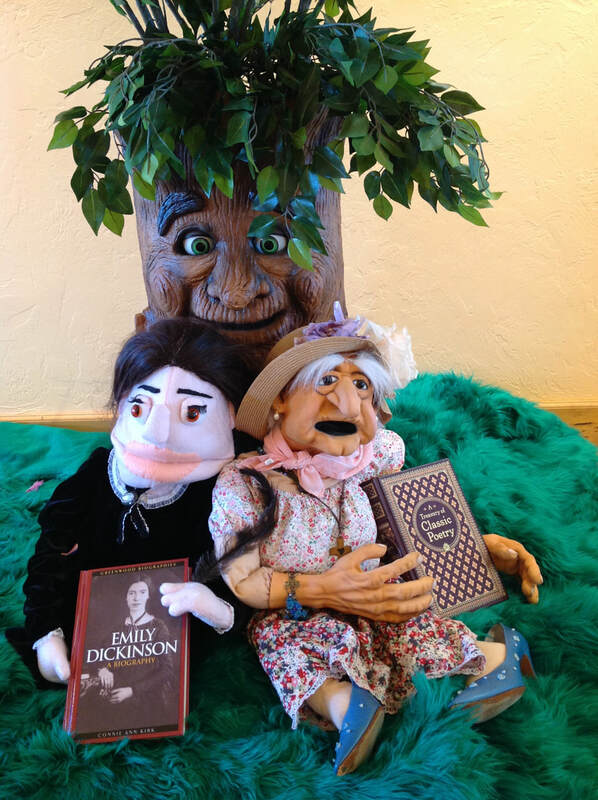 Join us for Cowboy Kit's debut with the Tucson Puppet Lady, Rose Mayer and Lulu at Valley of the Moon Tucson on April 6, 2019 for their 1st Saturday event from 11:30 - 1:30pm. If you would like to have a puppet show of Emily Dickinson, Granny Goodheart, Cowboy Kit, or Shakespeare, we are ready! Be prepared for the vibrant and entertaining wit of Emily, Shakespeare and Granny while enjoying their wisdom through poetry and story-telling. If you want to here cowboy poetry and songs of the Old West, Cowboy Kit is sure to entertain! Just finished two course from edX: Hamlet's Ghost (Harvard), taught by Professor Stephen Greenblatt, and Shakespeare Matters (University of Adelaide), taught by Professor Lucy Potter to write, direct and perform, Shakespeare and Hamlet! Kit Cowboy is a singing cowboy. He is the original super hero of early western films. He always wore a light colored hat... that is how you knew that he was a good guy. He is famous for telling stories around the campfire of life on the trail -- all the challenges and hardships. Do you know that the singing cowboy served to preserve the cowboy as a unique American Hero. His horse is Champion, the wonder horse. Granny is my first puppet and is a combination of all of the wise men and women who I have learned from in my life. I started creating her from my remembrances of Sunday School, Sermons and Luther League, then later on, both from research on older adult development as part of a Master's degree from Bowling Green State University and from an edX course about Happiness from the Center for Greater Good, University of California, Berkeley. She is the embodiment of high moral character, goodness and happiness!